For those interested. This morning's incident at Halifax airport (CYHZ) with Sky Lease Cargo 4854, 747-400, registration N908AR. Reportedly the four crew were not seriously injured. Happened upon landing. Overshot runway a bit. Only about 5km from my workplace. My picture, taken from the perimeter fence next to the road. Is that a vertical crack in the fuselage? The speculative consensus is that the airframe is a write off; which is sad. But at least nobody was seriously injured. This cargo flight is a very regular 'lobster run', usually to Asia. A few years ago an airplane came up short on the runway at the same airport. Looks like most of the fault was with the airline. So it was coming in empty - no tons of rotting lobster involved? 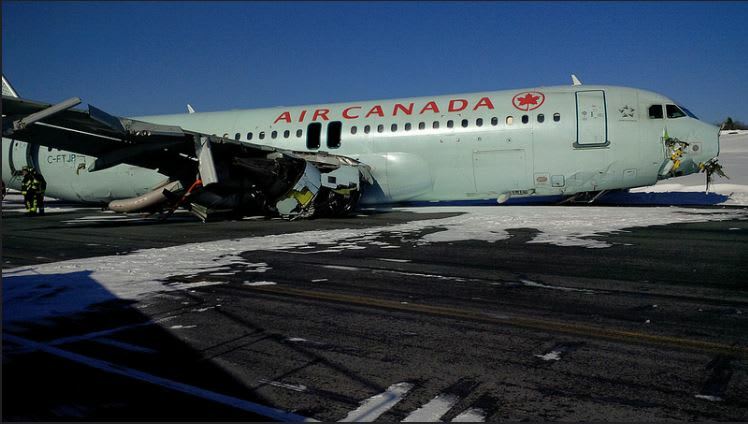 Air Canada 624 incident in 2015 (pictured above) was initially described as a 'hard landing' [?!?]. There were injuries. It was very close to being much worse; the approach was too low and the fuselage just cleared the embankment. MK Airlines 1602 crash in 2004 was bad. Seven crew killed. 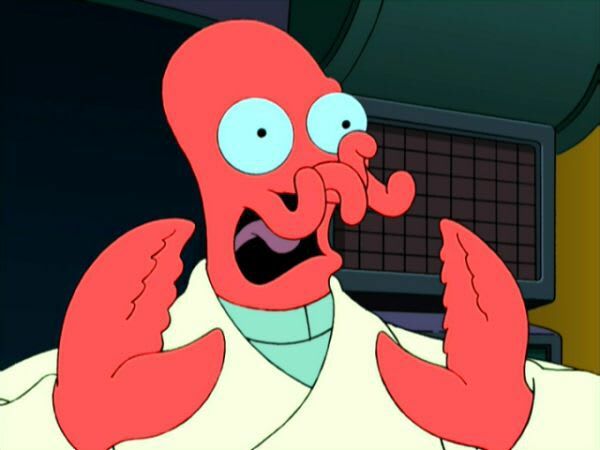 That was the one that involved over 50t of lobsters and other seafood. From what I'm reading the longer runway had construction, the wind was strong, and the weather had a low ceiling with rain. Seems clear cut that the pilots goofed and landed long or otherwise exceeded the capability of the aircraft to stop in time. An update with some interesting pictures. Certainly, one big question is where on the shorter runway did the airplane land and was that an error on the pilot's part if he landed too deep into the runway. Yikes, found out from others that the wind was 260° at 16 knots gusting to 21 knots. This is a 18 knot crosswind and an 11 knot tailwind. I'm sure the 747 can handle the crosswind but a tailwind adds a lot to a landing roll distance. Looks like they needed to use that runway as the opposite side doesn't have an ILS instrument approach (only GPS approaches, not sure if the aircraft was equipped for those). VE1BLL; Always amazed by how Canadian newspaper articles seem to be written by intelligent clear minded responsible authors as compared to virtually every American newspaper article - written by clueless idiots. Was thinking the same thing, Keith. "It was to be loaded with live lobster in Halifax before heading to China, with a stop along the way in Alaska." They are playing to their audience. That was a low punch. Years ago, after a pipeline disaster in Canada, I read a Canadian newspaper account and was floored that it stated diameter, flow, pressure, depth, type of soil, and other conditions during normal ops and then just prior to the disaster. Then I see the above article and realized that first article wasn't just a fluke. They tried but the local authorities didn't give them much to work with. The news today mentions that a back hoe is being used to break it up (or perhaps into sections?). 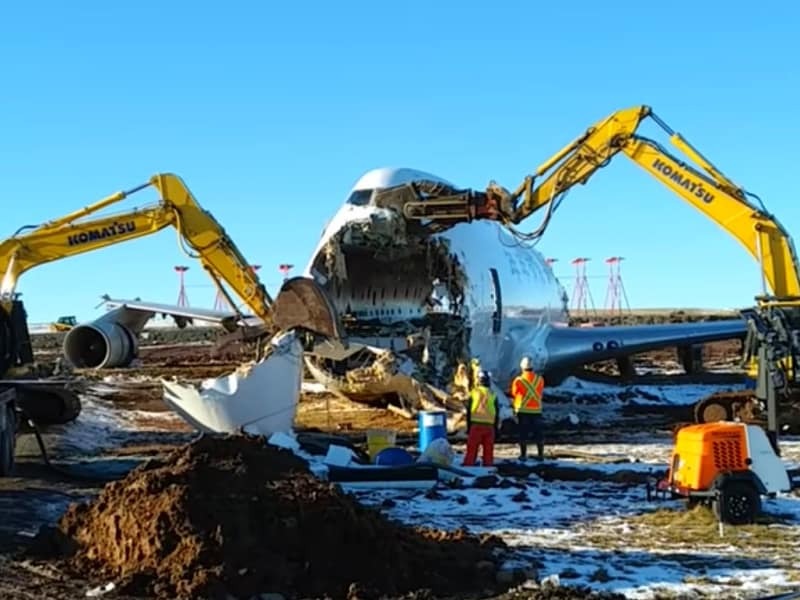 bah, it's "Backhoe rips into mangled plane after Halifax runway overrun" THAT sounds WAY more interesting, but still no photos. Avweb reported two runway overruns, the 747 barely garnered a sentence. A couple of runway overruns in the last few days have wrecked millions in hardware but did not hurt anyone seriously. On Friday morning, a Fly Jamaica Boeing 757 went off the end of Cheddi Jagan International Airport’s runway in Guyana and plowed into a sand pile at the lip of a 40-foot drop. The plane had taken off a few minutes earlier for Toronto and returned after reporting hydraulics problems. There were 120 passengers and eight crew aboard and six were slightly injured. 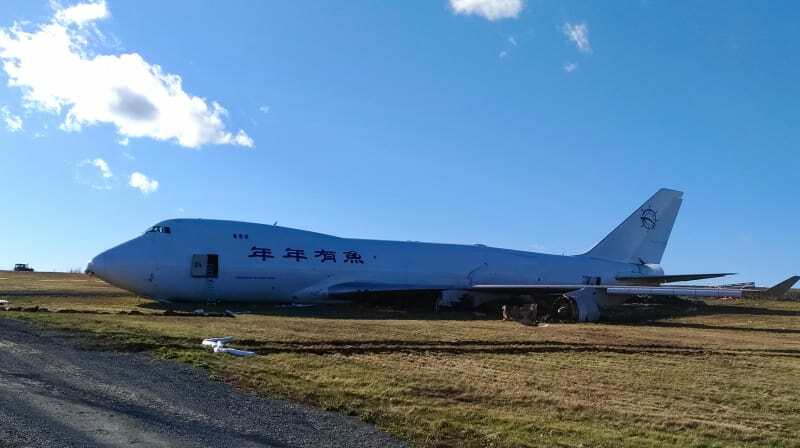 That airplane might be useable again but a 747-400 cargo plane will be taken to the scrap heap from Halifax’s Stanfield International Airport. Ack, click-bait; videos of backhoes moving abOUt, but no ripping. btw, the Chinese name on the plane is far more interesting than the English Skylease; literal translation is "year year have fish," i.e., "We always have fish"
From the ATC record, I noticed that the fire crew asked if there were any dangerous goods on the aircraft. It is interesting to consider just how much complex data management would be required for ATC to actually have the aircraft manifest at their fingertips, and be able to answer that firefighter's question. I'm kinda surprised that this totaled that 747. I presume it was pretty much empty and even low on fuel weight being at the end of it's trip. Just hitting dirt totaled it. I'd kind of expect some aerodynamic jolts to be greater than what this low-speed over-run would deliver, yet 747s aren't noted for cracking in half while in flight. The plane was 21.7 years old. That's getting to the age at which most large planes are always a couple flights ahead of being scrapped anyway. The reaction to breaking the wheels off may have broken its back. Eating dirt has made the engines worthless. Half the value of the plane gone right there. More than half - that's an old airframe. There might be value in the avionics... probably not much though. It didn't take long to cut it up, so clearly not much time was spent pulling the boxes out. Broken back? Barely worth the scrap value to cut it up and carry it away. Somebody might break even. In some ways there is "educational" value in having a scrap airframe around, to train students on techniques of assembly or maintenance. But this way of getting one isn't ideal, either. 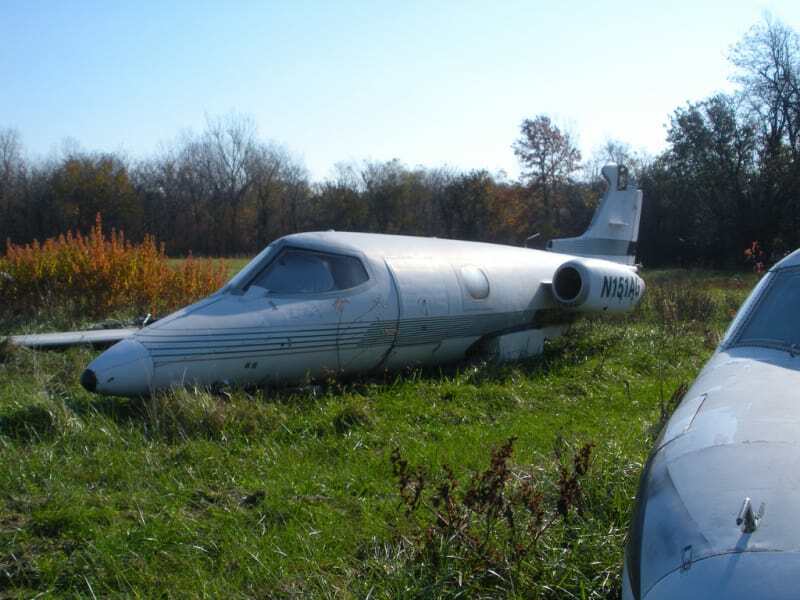 A scrap Learjet is a lot easier to store than a scrap 747! Video of part of the demolition. The forward section would've made a brilliant housing unit for some handyman entrepreneurial type. I understand the need to get it removed quickly, though. Somewhere out there a flight sim enthusiast is crying.